This is just a quick update. We’ve moved out of Long Beach, CA and are successfully hold up in a hotel in Alexandria, VA. We’ve been here almost two weeks. Strangely, a “full kitchen” here only consists of two burners and no oven. I’m beyond tired of using crappy pots (there is nothing here you can describe as a pan) on uneven burners (all the oil runs to one side) with no oven. Our hotel sojurn is to be over soon. We’ve applied for, and been approved to, rent a townhouse just off the mainstreet in Old Town Alexandria. The advantages of the townhome include its location, it has a large finished basement, and has actual outdoor space (unlike our patioless apartment at Patio Gardens in California). The disadvantage is that the kitchen is small and has no dish washer. I plan to turn the sun room which is accessed off of the kitchen into a combination pantry and preparation area. On a more temporally relevant note, we do get to spend Thanksgiving with family this year. I planned somewhat in advance this year and order a Narraganset turkey from Springfield Farm. The farm is only a few miles from my parents’ domicile. When we went to visit them a week and a half ago, we stopped by the farm on Sunday. While Angela was discouraged by the cold weather, my father and I hiked the short distance up a hill to visit the turkey paddock. By no means am I a poultry expert, but the turkeys seemed well taken care of and happy. In particular, any time we made a loud noise, a wave gobbling would spread over the turkeys. 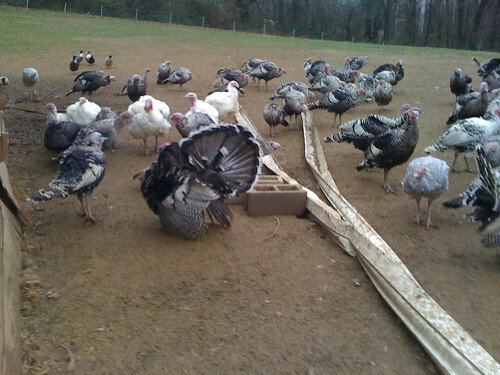 Unfortunately for them (but fortunately for us), the turkeys were scheduled to leave for the slaughterhouse the next day. My parents went by this past weekend to pick up our recently deceased turkey. I have yet to see it so I can’t comment on it yet. I did leave instructions for my mom to use the same brine as for herb-brined roast chicken on it. We used the same brine last year and it turned out spectacularly. I’d encourage anyone to use it (in fact, my cousin Amy who we shared Thanksgiving last year with). In any case, happy Thanksgiving to everyone. I have been quite remiss in maintaining this blog over the past month. It’s been almost a month since there was a post. My apologies for that. But I have an excuse. Next week, we’re moving to northern Virginia. Specifically, I took a job in Springfield, VA. One of the primary motives for this move is to be closer to family. My parents live in Maryland and Angela’s live in Florida. We haven’t decided where to live yet (as of November 13 we’re technically homeless) but we’re thinking about the Alexandria area. But that’s only speculation at this point. What does this move mean for this blog? Not much. The primary changes will be that my hiatus will probably continue for a few more weeks as we continue to prepare for the move, find a place to live, and then unpack. On the positive side, there will be more family around which means that we can have more family dinners and I’ll have the opportunity to prepare more elaborate dinners. Or so I tell myself. If you have any advice on northern Virginia, I’d love to hear it. Today is the one year anniversary of this blog. I’m hesitant to point anyone to that first blog post (notice that I did anyway). More than anything, it is a personal accomplishment that I continue to post on here one year later. For those who actually enjoy reading this blog regularly, you should thank Angela for encouraging me to write this and, in all probability more importantly, setting up the blog so that I wouldn’t have an excuse anymore. And she thought up the name. According to the statistics, the most popular post to date is Gratin Dauphinois Madame Cartet which is appropriate as it is one of the best recipes on here. If you haven’t made it you should. That is followed at a distant second by my Homemade Pancetta. It’s also good but requires more specialty ingredients to make. At some point I decided that I wanted to start a food blog. Because what the world really needs right now is another food blog (not, as many people would guess, world peace). And, of course, I’m highly (un)qualified to write one. However, there does seem to be a dearth of food blogs from our locale (that would be Long Beach, CA). I found one a few weeks ago but now can’t seem to re-find it (it’s like it disappeared into the ether). You’d think that a city of 400,000 could at least scrounge up a couple of food bloggers so I wouldn’t have to do it. As for the name, my wife decided on that and, as with many things in life, it didn’t matter what I thought (of course I didn’t have the faintest idea of a name for a food blog; as long as it wasn’t the typical Cookingwithgastroeats). Or maybe we should’ve named it that.